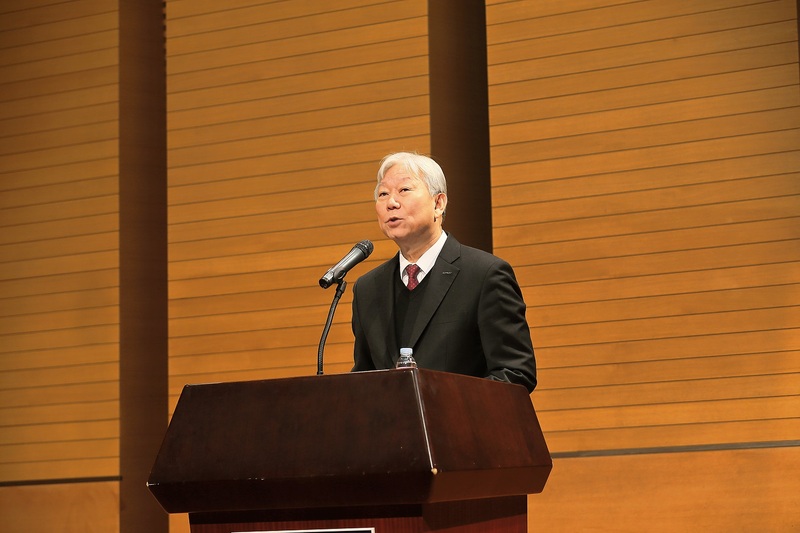 UNIST President Mooyoung Jung extends his new year's greetings to all members of the UNIST community at the New Year 2018 Kick-off meeting on January 2, 2018. The New Year 2018 opening ceremony was held in the auditorium of Main Admin. Bldg., UNIST on January 2, 2018. Earlier today, UNIST President Mooyoung Jung extended his New Year greetings, wishing happiness and prosperity to the entire UNIST community. 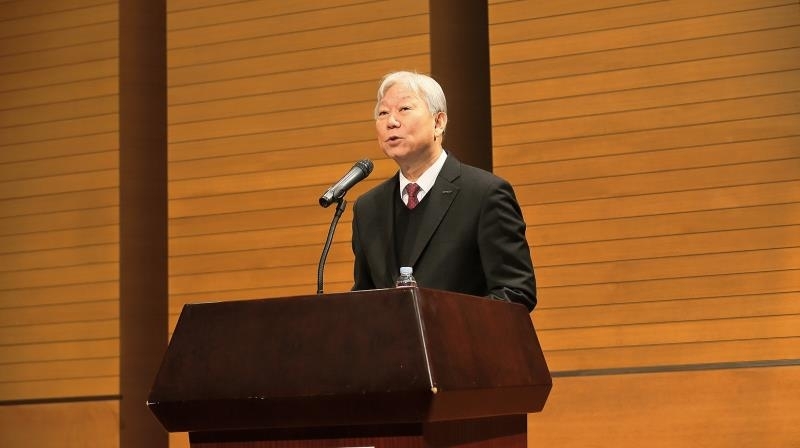 In his New Year’s message this year, President Jung recounted, “The year 2017 has been a rewarding year for all of us, as UNIST has proved its scientific excellence and competitiveness in the worldwide university assessments.” He also mentioned some notable achievements in 2017, which involves the smooth progress of UNIST research brand project and the enhancement of UNIST’s research competitiveness in international markets. The New Year 2018 opening ceremony was held in the auditorium of Main Administration Building at UNIST on January 2, 2018. In the New Year 2018, UNIST aims to establish a solid foothold in startup sector with the help of UNIST research brands, as well as the recently-established UNISPARK. 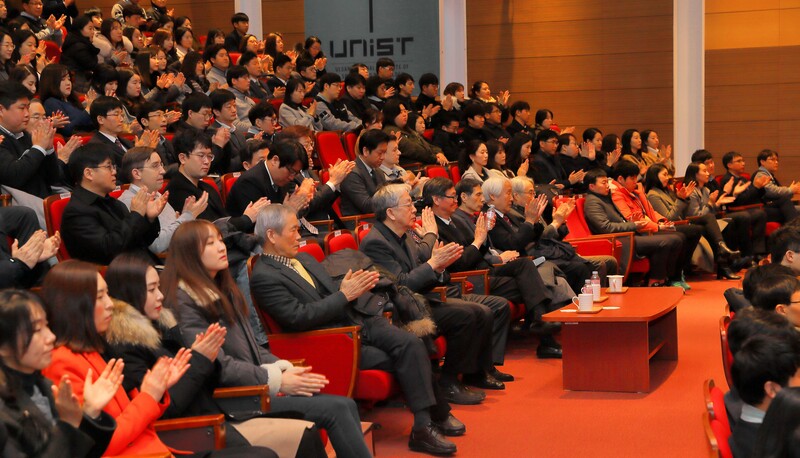 In addition, with the help of UNIST’s new Industrial Complex campus in Ulsan and by working closely with its family companies, UNIST will foster close and mutually beneficial industry-university partnerships. Besides, with the newly-launched Task Force Committee as the center, UNIST plans to create a new, more preferred administration system and organizational culture, suitable for world-leading science and technology-oriented universities. On the threshold of another promising year of growth and development, President Jung has asked the entire UNIST community for their understanding, support, and committment to ensure that 2018 is an especially successful year. From left are Professor Sang Il Seok (School of Energy and Chemical Engineering), President Mooyoung Jung, and Team Leader SeonIl Kim (Research Promotion team). 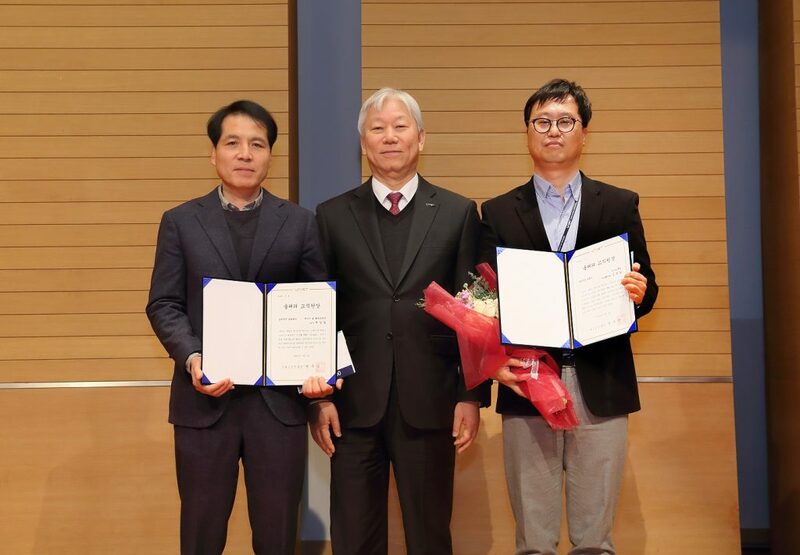 At the ceremony, Professor Sang Il Seok in the School of Energy and Chemical Engineering and Team Leader SeonIl Kim (Research Promotion team) were awarded with the Global Award and Convergence Award, respectively. Professor Seok has raised UNIST’s reputation by having his paper published in a world-renowned scientific journal Science twice a year and winning the 2017 Korea Scientists Awards. Team Leader SeonIl Kim was given this award in recognition of his outstanding accomplishments in setting the goals to achieve research funding and to foster UNIST research brands. At the ceremony, Young Kwang Kim (Safety Management team) was awarded commendation from the Ministry of the Interior and Safety (MOIS). From left are Young Kwang Kim and President Mooyoung Jung. 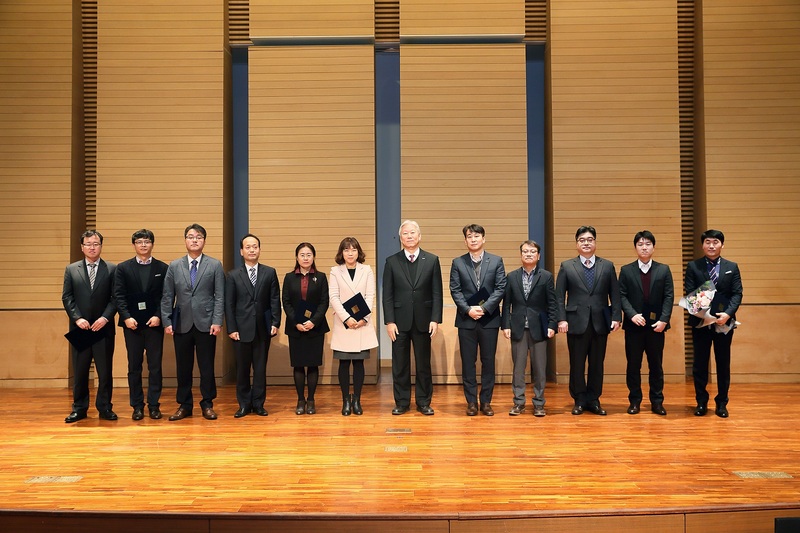 At the ceremony, Young Kwang Kim (Safety Management team) was also honored with commendation from the Ministry of the Interior and Safety (MOIS) in recognition of his local community safety and crime-prevention work. From left are the group leader YoungDae Ahn (ServeOne), Jun Ho Lee (Academic Affairs team), Ah Ran Kang (Research Management team), Hye Jin Yeo (Business Incubation Center), President Mooyoung Jung, Tai jin Park (Public Relations team), Hyunjung Jung (Audit office), Hee Jin Yeo (Student Affairs team), and Yujin Han (School of Life Sciences). The above exemplary staff members were also recognized for their excellent services to UNIST. 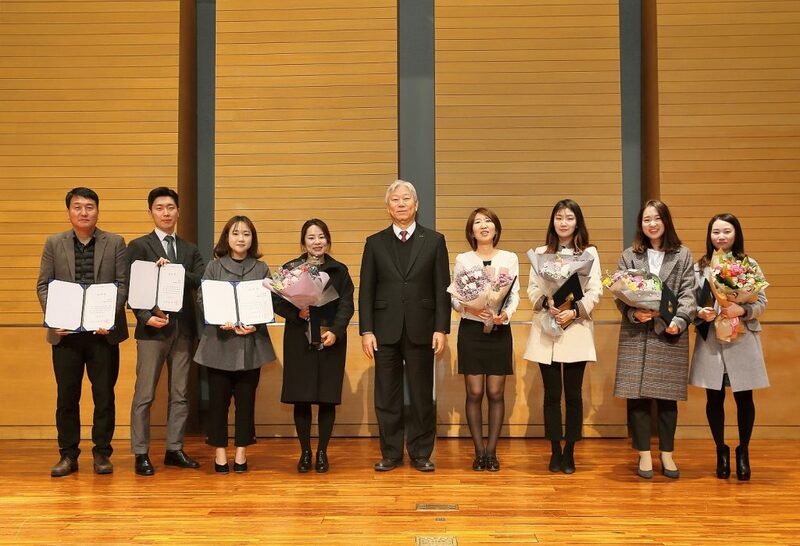 The following recipients were honored with the Individual Service and Contribution Awards at the ceremony: Jun Ho Lee (Academic Affairs team), Ah Ran Kang (Research Management team), Hye Jin Yeo (Business Incubation Center), Tai jin Park (Public Relations team), Hyunjung Jung (Audit office), Hee Jin Yeo (Student Affairs team), and Yujin Han (School of Life Sciences). 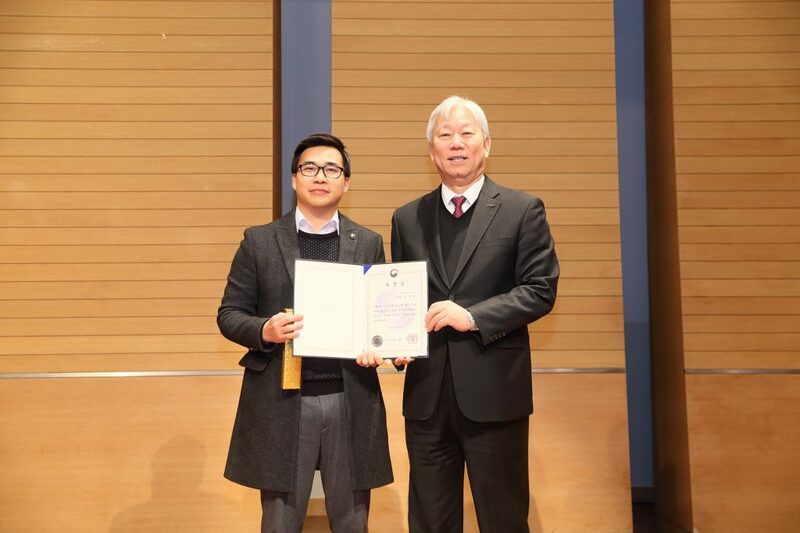 Besides, the group leader YoungDae Ahn of ServeOne were given President’s commendation for his excellence in support service. President Mooyoung Jung (center) and the recipients of the annual Outstanding Team Award: From left are Technology Commercialization Center, Research Promotion team, Budget team, Academic Affairs team, Library team, Research Management team, UNIST Central Research Facilities, Center for Healthcare and Counselling, and the Administration Centers for School of Business Administration, School of Design and Human Engineering, and School of Materials Science and Engineering. Based on the 2017 Team Assessment, the following teams were also recognized for their outstanding work. In the business sector, the following three winning teams were announced: Technology Commercialization team, Research Promotion team, and Budget team. In the support services sector, the following teams were selected: Academic Affairs team, Library team, Research Management team, UNIST Central Research Facilities, as well as the Center for Healthcare and Counselling. In the academic sector, the following administrative offices were praised for their excellence in performance: School of Business Administration, School of Design and Human Engineering, and School of Materials Science and Engineering. Click HERE to read the New Year’s Message from President Mooyoung Jung.